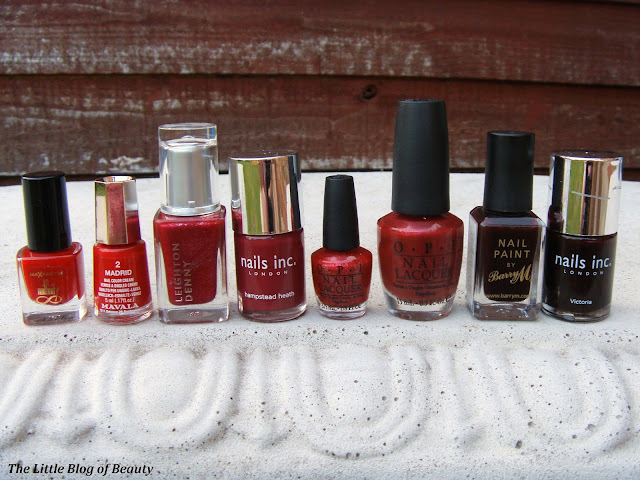 If you're a regular reader of my blog I hope you've been enjoying my nail varnish collection posts. Today it's the turn of the red's. I thought I would have loads of different types of red's, but I don't actually have very many, maybe because I think I'm more of a pink nail varnish kind of girl. My boyfriend bought me several of these little mini Max Factor nail varnishes for Christmas, which he gave to me in a little box, and this was one of them. This is a pretty standard red and there's not a lot more to say about it really, it's a nice little red shade. This is the first Mavala nail varnish that I've tried and I received this as part of a prize package from a blog giveaway. This is very similar to Red Passion but is not quite as deep, Red Passion is more of a cherry red and this one is just slightly more orangey red. This is the only Leighton Denny nail varnish that I own and I won this is from some kind of online competition. I can't remember which website it was but I believe it was for a magazine and there was something like two hour timeslots throughout the day where if you entered your details you could win one of however many of a particular product. I loved this as soon as I tried it and I'd love to get my hand on some more Leighton Denny shades. This is a deep more burgundy red which has a fine shimmer running through it. This would be a great shade for the festive season but would also be great in summer so the sun can catch the shimmer. I think I probably have more Nails Inc nail varnishes than anything else but this is mostly because every so often Glamour magazine offer Nails Inc varnishes as a freebie with one of their issues. I love it when Glamour do this as with an RRP of £11 each, getting one free with a £2 magazine is an amazing bargain. 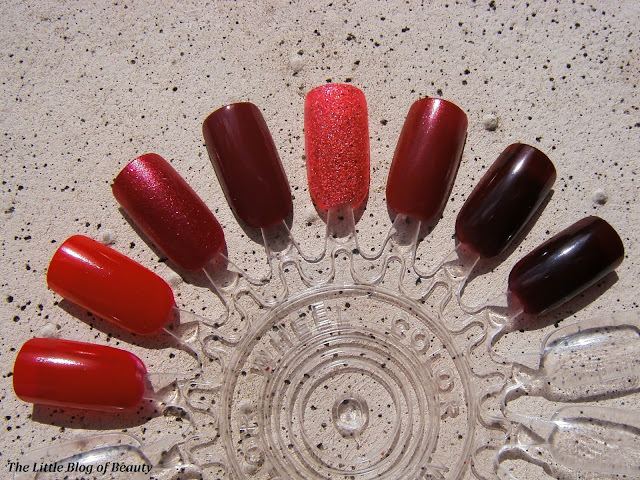 There's usually four different shades available and if I like them all then I'll grab one of each! Hampstead Heath is one of my go to winter shades and I'm actually about half way through the bottle. This is a clean dark burgundy shade which I really like. This is a liquid sand nail varnish (from the Mariah Carey liquid sand mini set) and admittedly it does look as pink as it does in the picture but I included it in the red's because, well at the time of splitting my nail varnishes into colours I thought it was a red. This is supposed to include star confetti but apparently none of this came out when I painted the wheel. I was shopping in Westfield Derby one day when I spotted a billboard advertising that if you spent £50 or over you could go to the concierge and claim a free OPI nail varnish. A quick check of my receipts confirmed I had spent £50 so off I went to go and collect my freebie. 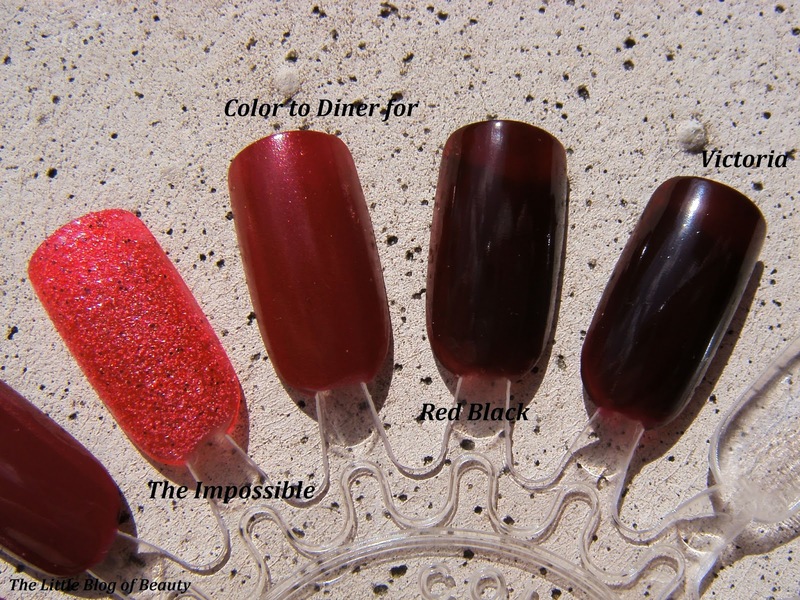 There were three shades to choose from, I can't remember what the others were but I went for Color to Diner for. This is another burgundy type shade but is lighter than Hampstead Heath and I think has a very slight shimmer running through it that's difficult to see unless you catch it in the light. Red Black is a good name for this as it is such a dark red it is almost black. I'm not entirely sure about this shade as I think it may be a little too dark for my liking. I believe Victoria is one of Nails Inc's most popular shades but I'm personally not that keen on it. I found this very thin compared to other Nails Inc shades and not as easy to apply. This is a very similar shade to Red Black so if you're a fan of Victoria then Red Black is possibly a very good and much cheaper dupe. The scratch you can see on the lid in the picture is there because when I first got this (as a freebie with Glamour magazine!) I couldn't for the life of me get the lid off. It appeared to be completely and totally jammed on. So I had a bright idea to try using one of those kitchen utensils that you use to try and open jars when the lid just won't budge. This didn't work too well as the grippy parts just slipped round the lid creating scratch marks! I have no idea how I eventually got the lid off, I expect it was probably brute force courtesy of my dad! So those are my reds. Which do you prefer, pink's or red's?